Kerala tea stalls (chaya kada) always caters for a number of snacks which are mostly deep fried in oil.They are served hot in the local area tea stalls where they have no left overs after 5pm.We have one such tea stall in my place and that's running since my childhood.Parippu vada,bonda,vettu cake,uzhunnu vada,sukhiyan,ulli vada are the top listed ones and each day its something different and some tea stalls have all different ones everyday too.However,oru cup chayayum,choodu parippu vadayum(a cup of tea served with a warm parippu vada) or another delicacies is very pleasing and delicious.But back here,winter is the best time to eat hot snacks like vadas,sukhiyan,bonda,kachori or pakoras.My family just loves to eat snacks with a hot cup of tea.Sukhiyan is one sweet treat that has nutritious value of green gram(cherupayaru) mixed with jaggery,dipped in batter and deep fried.These are similar to munthiri kothu which I had posted sometime back.Munthiri kothu is smaller in size and they can be stored longer whereas sukhiyan is perfect for an evening snack only,no storage possible unless refrigerated.This was one of my favorite snack as a kid and mom used to make it often to sneak in green gram(cherupayaru).Though I have tried a simpler version of sweet moongdal puffs using puff pastry sheets sometime back,but this is the authentic version.Do give this a try if you love sweet snacks and enjoy on a chill day !!! Cook the green gram for 2 whistles or till tender. (read notes).Leave the cooker till the pressure releases.Check if done,the gram should be cooked,tender and just begins to break open.If its not done and there is no water left,add 1/4 cup water and cook covered on low medium flame till done. Melt the jaggery in 1/4 cup water in a pan and strain the impurities.Put it on flame and add the grated coconut and wait till the water is almost dried up.Add the cooked green gram and add cardamom powder,a pinch of dry ginger powder,a pinch of salt.Mix it well and switch off flame. Using your hands make 12-14 balls when the mixture is ready to handle. Heat oil in a wok and wait till its hot.Keep on low medium flame. Make a thick batter using all purpose flour /maida,turmeric powder,salt and water.Dip each ball in the batter using hands and slide it in oil.Deep fry in oil by turning all sides.Wait till its crispy. Drain using colander on paper towel.Serve warm with tea !! * The cooking time and water required to cook may vary depending on each brand of green gram but it will be almost similar to this.Mine took exactly two cups of water to cook 1 cup and 2 whistles to get it done.The water was completely used to cook it. * Rice flour adds crispiness to the snack.Omit if not interested. *Adding turmeric powder is optional,adds a light color to the cover. For more Kerala snacks,click here. my favorite snack.. i miss this a lot from my home town.. So it's kind of vada but stuffed. Love this. I've never had this, would love to grab some for my evening tea! Mouthwatering here. Looks very delicious. So inviting dish. Looks tempting! This is new to me. Thanks for sharing. 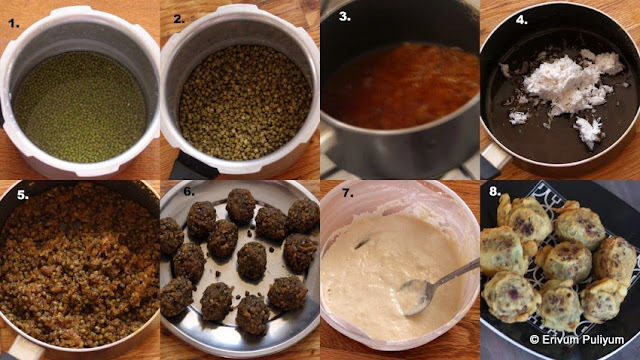 I think this is a great recipe for kids, all that green gram. Looks yum! I've always wanted to go to a chaya kada in Kerala, and if this is the kind of palaharam they have, then all the more reason for me to go. This sounds delicious, Julie! One of my favorite sweet, we usually make suzhiyam with chana dal, whole moong is sure a healthy option! nice clicks dear! Nice clicks! And perfectly made sukhiyans..
We make it with chana dal, I have to try this version, looks very delicious..
Last weekend I was debating whether to make sugiyan or munthiri kothu finally he jumped in and made some parippu vada for me. I always find our likes going in the same track Julie sugiyan ohh kodipichu !